James E. Rung is my dad and he is a World War II veteran. He kept a small logbook that he used to write down information during flight briefings and, after each mission, he made comments about his experience. This blog will share those entries with you. Dad was assigned as a navigator to the 8th Air Force, 1st Division, 41st Wing, 379th Bombardment Group, 524th Squadron based in Kimbolton, England, a small village about 24 miles west of Cambridge. This group flew B-17’s to targets in Europe. Most of Dad’s missions were to targets in Germany. Dad’s 35th mission was completed on Christmas Eve, 1944 and he returned to the States in early 1945. In 2010 we pursued obtaining the medals Dad deserved for his service. With help from Senator Claire McCaskill, Dad received his European-African-Middle Eastern Campaign Medal with 3 bronze Service Stars; his Air Medal with 4 bronze Oak Leaf Clusters and 1 silver Oak Leaf Cluster; his World War II Victory Medal; and his Honorable Service lapel button WWII. It was quite the honor to receive these items well over 60 years after his service. 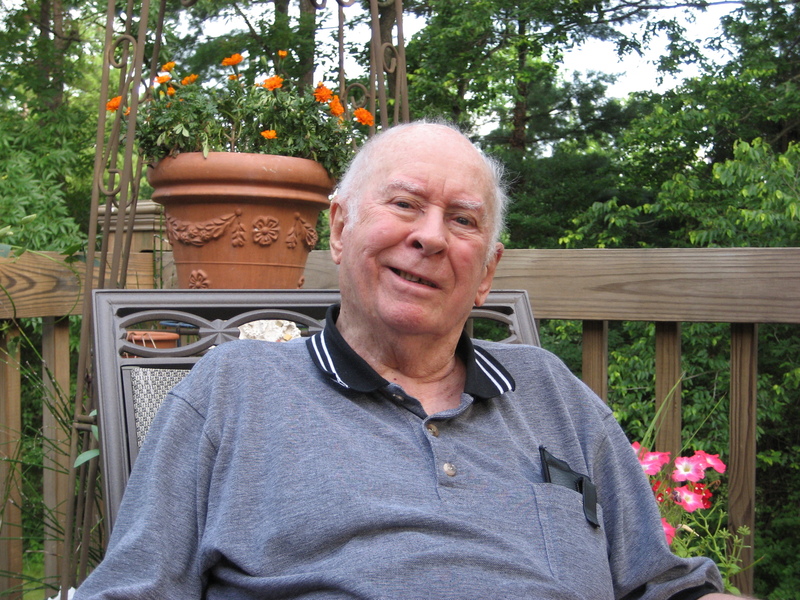 Dad turned 90 years old on September 3, 2010. A flag was flown in his honor over our nation’s capitol on that day and he received it prior to Christmas 2010. Dad passed away on May 31, 2014. He was 93 years old and a stinker up to the very end! He was laid to rest at Jefferson Barracks National Cemetery on June 5, 2014. On June 6th, our friend, Andy Groom in England, took Dad back to Kimbolton for one last visit. In many ways, Dad’s journey has come full circle. We miss him terribly. Dad’s final resting spot at Jefferson Barracks Cemetery, St. Louis, MO. Those are pistachios on the headstone and walnut cookies in the container – 2 of Dad’s favorite things. The flag flown over the Capitol in honor of Dad’s 90th birthday. My name is Zachary Rung and James is my grandpa by blood, this was very interesting to see thank you! I am curious to know the name of my grandpas parents and his grandparents can you email me?